Back in 1980 when I was 9, I sent in a card to get one free issue of Popular Mechanics hardcover encyclopedia. 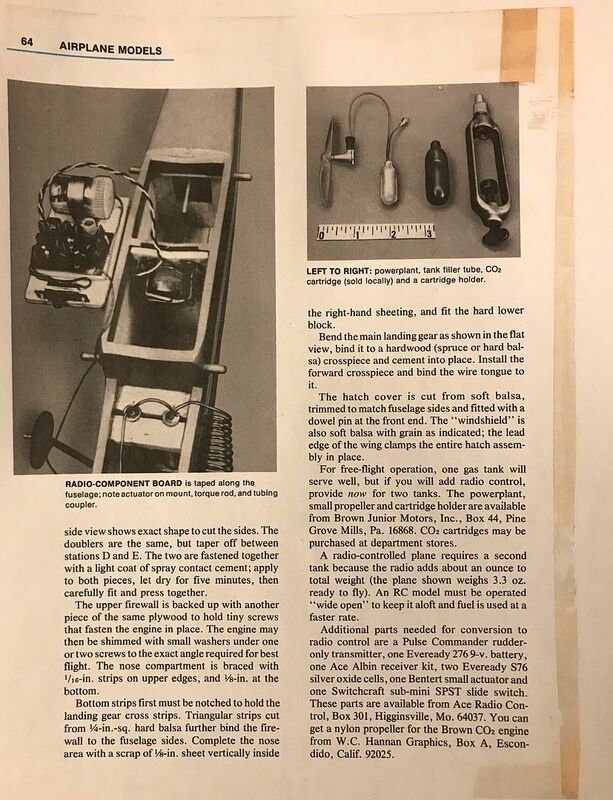 I had just started into the hobby a few years earlier with a Cox rtf control line trainer, and I was trying to build a few stick and tissue rubber kits. My father (who ran a woodworking shop) also bought me some balsa and cut it up into sheets and strips for me to try some building. When I received the 1st (and only) issue of the book, I was absolutely thrilled to see some model airplane articles - including this 5 page build by Howard McEntee on the “PM Bee” - a CO2 powered balsa and tissue model for single channel RC. I took the Cox .049 out of the plastic plane and thought I could fit it into the Bee, but even at 9 yrs old I knew it wasn’t going to work, as the engine was huge compared to the approx 24” WS model and I didnt have a radio anyhow. Fast forward to 2019... I was looking through some plans and found my copy of the book. I also have a Gmot 120 still NIP with the charger and a box of soda bulbs, from my dabbling into CO2 power several years ago. I think the 120 would be great for the PM Bee, as it is designed for models in the 24” WS range. I really need to re draw the plans or get them blown up and build this thing again. I just made a trade for an Ace pulse commander set! I’d love to build it again and actually get to fly it. if its got a wing or two and an engine - I like it! This takes me back in time, a great article and story. In1955 I attended my first of 3 Air Cadet camps air Sea Island Airport Vancouver BC. One of the projects was to build a model aircraft. I built a cox.049 control line plane that looked like a jet. My dream to be a jet pilot, came true. I wish I still had a photo. Now 64 years later and after a lifetime of RC, full size, from lite aircraft to commercial jets I am still aeroplaning. Just finishing a 1/3 scale Clipped Wing Cub getting ready for paint. Follow your dream and never give up. That’s a great story! I love things like that. This hobby is very meaningful to me for many reasons, not just something to kill time. Everything I do reminds me of the past my mentors and friends and all the fun I’ve had in my time in the hobby. And, I’m just a “younger” guy in the hobby yet! My avatar is the earliest photo I have of my modelling exploits. I’m on the right. That’s a scratch built RCM “Hornet”, a two channel plane I was stupidly trying to fly with rudder/elevator - instead of the ailerons and elevator it was designed for. With a flat wing, I didnt have a chance. With the over weight Kraft radio, and underpowered Cox Golden Bee .049, it was a lot of fun trying but not much success in the flying part. I had better luck a few years after, when I was 15 or 16, with an older Futaba radio (4 channel) and a OS .10 engine with throttle. I bought a used Pilot .15 size trainer and flew it pretty well for teaching myself. Memories! That’s what the hobby is about to me. I appreciate your post. Hey Andrew. Great project. I too can relate the PM inspiring me. I still have those old PM books. The model I recall the most was the hoop-skirt model. (I think that is what it was called). It had a round wing in the shape of a barrel that went AROUND the fuselage. It looked so cool and the picture in the book had one in flight. I have the issue with the hoop skirt - it was a Roy Clough Jr design. But that was an earlier copy of the encyclopedia and it was given to me by a friend. Some neat stuff in there for sure! Look what arrived in the mail today!! I think the actuator was called an escapement. Or was the escapement before the actuator. I remember the escapement was powered by wound rubber strands much like a prop on a rubber powered model. There must have been an electrical connection to the escapement. I think the command was a pulse for a right turn and 2 pulses for a left turn. That was a long time ago, maybe someone else can comment or correct me. These have an actuator - basically an electromagnet if I understand it, and it makes the control flip back and forth. Escapements were the rubber band wound up things (thats about as much as I know since Ive never used one, just read about them in the older magazines). The pulse commander uses the back and forth motion of the actuator biased to the left or right to control the direction. Even though the rudder is constantly wagging, in concert with the transmitter control, it will wag more off to one side or the other so you get proportional directional control. With a new 250 mAh nicd flight pack, and the transmitter rewired to accept a modern size 9V battery... it’s working!! State of the art lol. If that goes like that throughout the whole flight on the flight surface, them hinges must be darn good! That's a lot of twitching. Wow, and neat all at the same time!